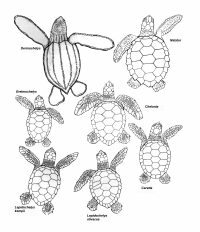 The following pictures illustrate some of the external morphological structures used to identify sea turtle species. These structures can also be used to reference a specific point on the body – such as the exact location of an injury, scute anomaly, etc. Where a series of scutes or scales have the same name (e.g. “vertebral”, “marginal”) individual scutes or scales can be differentiated by numbering them from anterior (head) to posterior (tail) and by noting the right or left side of the body (e.g. “sixth right marginal scute”). 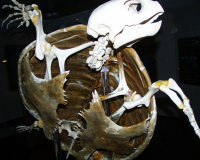 Anatomical features associated with the head of a sea turtle can help identify the specimen to species. 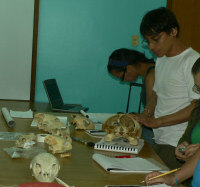 For example, the number of prefrontal (pf) and/or postorbital (po) scales can be diagnostic. 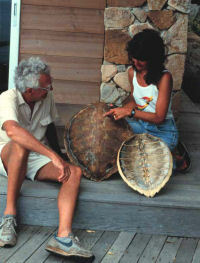 In these illustrations, notice that one pair of prefrontal scales is unique to the green turtle (Chelonia mydas), while the hawksbill (Eretmochelys imbricata) has two pairs. 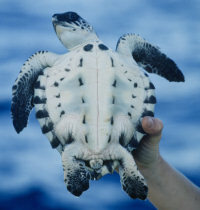 Adult leatherbacks (Dermochelys coriacea lack scales entirely. 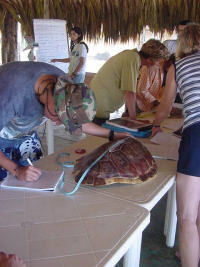 Anatomical features associated with the carapace (upper shell) or plastron (lower shell) of a sea turtle can also help you identify the specimen to species. In these illustrations, notice that vertebral scutes define the midline of the carapace, while costal (lateral) scutes are paired on either side. Whether or not the first costal scute makes contact with the nuchal scute is an important characteristic to note. 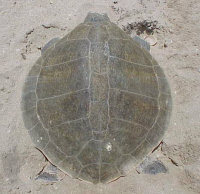 Inframarginal scutes, sometimes called bridge scutes, span the distance between the marginal scutes and the plates that comprise the plastron (h, p, ab, f). Click here for a helpful Glossary of terms.